When I was a kid, I loved stories. Loved writing them. Loved telling them. Loved the attention and praise that stories sometimes brought me from teachers and other kids. This led me to picture a life as a writer, one that would be filled with TV appearances, crowded book signings and high-paying worldwide lectures that might just involve a private jet. Writing, of course, is an unpredictable business. Like many writers, I’ve learned the tough truth is that it’s easier to earn a living by teaching writing than it is to earn a living by writing writing. 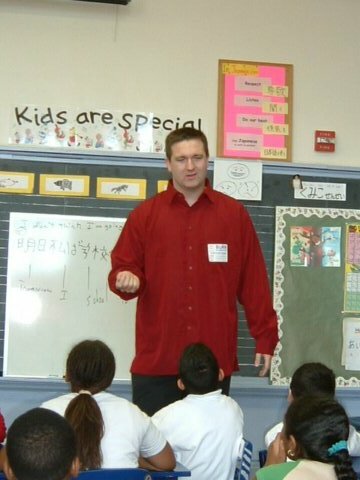 As a result, I’ve spent much of my career as a kind of itinerant writing teacher (the classier term for this is “visiting author”). I’ve worked in dozens of schools all over Kentucky and elsewhere. Sometimes my visit lasts fifty days, sometimes fifty minutes. Either way, I take the opportunity seriously. I vividly remember the two special visitors who came to my classrooms when I was a child. One was the county coroner. He said the chemicals he used on corpses always made him thirsty. The second visitor was a well-known Kentucky writer, someone my mother said was considered something of a legend. This man did provide a valuable lesson, though probably not the one he intended. I don’t remember anything he said about writing, what sticks with me thirty years later is that he was about my grandfather’s age, seemed nice, maybe a little uncomfortable, and he was wearing red-and- white-striped boxer shorts. I know that because the legendary writer had forgotten to zip his pants. When I visit classes, I often feel like I’m less a writer than a motivational speaker with a very specific subject and audience. Plenty of kids are scared of writing because it seems full of rules that are alternately complex, vague and arbitrary. As a result, many of them see writing primarily as an opportunity to fail. I tell students (and teachers) that writing isn’t really about rules. It’s about finding words to communicate what’s in our heads and our hearts, in our memories and imaginations. I read them poems by George Ella Lyon, Frank X Walker or Anne Shelby (who happens to be my mother) and remind the kids that those writers grew up in Kentucky, too. I make sure the students understand that everybody has trouble writing the first line, and we all fear red marks from the teacher and bad grades (in whatever form they may take). I try to get the kids to write something—something fun, something wild, something real, without fear of judgment or correction. I tell them that no one owns writing. Sure, it’s important to understand the expectations of the teacher, the school or the state, but writing is everyone’s—yours, mine and theirs. Admittedly, my approach doesn’t always work, at least not during my actual visit. But sometimes, I’ll see a little girl pick up her pencil and surprise herself by the words that come out of it, and she’ll realize for maybe the first time, that this writing stuff can be fun. Moments like that weren’t part of any fantasies I ever had about the writing business, but they are part of its many unpredictable rewards. Kids writing for fun–I bet their writing is fun to read!